MiFID II: Rise of the websites? Much has been written about MiFID II, the EU’s revamped Markets in Financial Instruments Directive, which comes into effect on January 3rd 2018. Andrew Rigby takes a look at the potential implications for digital managers. MiFID II is a package – a very long one at almost 1.5 million paragraphs – of EU legislation that aims to bring greater transparency to financial markets. Ultimately the EU wants to make it easier for investors to see what they are paying middle-men (brokers and asset managers) for: research on and meetings with companies and their management teams in particular. The costs for these will have to be unbundled from charges for buying and selling shares, which has not been the case to date. So while the bulk of the impact will be felt by financial institutions across the world – because any transaction that touches the EU is affected – there are likely to be implications for IR and communications teams. If research and corporate access now has to be paid for in a more transparent way, it is reasonable to assume that there will be much less of both from analysts in the post-MIFID II landscape. And what is produced and paid for, will have to be of high quality. IR teams will also need to work harder to communicate the company’s investment case directly to investors: produce more information themselves, and arrange and deliver more meetings. It seems to us that this is where the corporate website can help, in two ways. It can fill the gap created by the decrease in freely available research, by providing free access to company information for investors, journalists and other audiences. And it can provide more detailed information for those producing paid-for research. This might be especially useful as the effects of MiFID II begin to become apparent. IR teams may need to scale up to deal with the increased workload, but this may take time to achieve. In the meantime, the website can be used to deliver information at scale, so it is worth talking to the IR team to see how the company website can help them. More hard financial data might be useful, but so will a clear statement of the investment case, and ways to make senior management more accessible may be important – videos and webcasts. Our recently published ‘Explain Yourself’ index may be useful here. It highlights some of the companies which are best at telling their stories and presenting their leadership teams. One particular aspect worth considering will be consensus estimates. With less research, it is not clear how the likes of Bloomberg will compile consensus, and consensus based on algorithms or crowd sourcing is still in its infancy. Once again, the onus may be on companies to manage and distribute consensus – so the website comes into its own. 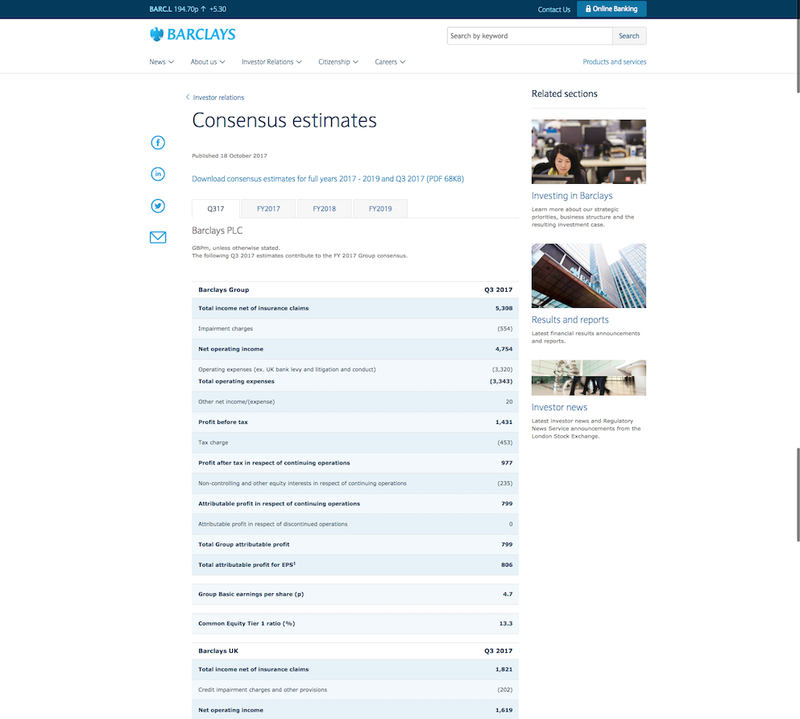 Barclays has a good example of a consensus estimates page. For those who would like more background on MiFID II, we have prepared a short Q&A. The US consumer goods giant goes online to make its case against an activist investor. Part of the company’s war chest went towards a microsite – voteblue.pg.com – which forcefully made the case for management and against Mr Peltz. Leading with the banner ‘A Profoundly Different P&G’, the microsite had facts and figures backing the company’s strategy; supporting quotes from well-known analysts and business professors; and attacks on Mr Peltz’s record. The microsite also had prominent ‘How to vote’ links for shareholders. Before the vote, the microsite was well signposted from P&G’s main corporate site. After the vote, the microsite was promoting the results. It is unusual for a company to set up a microsite to fend off an activist investor, and voteblue.pg.com is possibly unique in using the tactics of a political website – unapologetically taking management’s side; attacking its opponent; and frequent calls to action – ‘how to vote’. The political nature, and plain language, of the microsite may reflect the fact that P&G had to persuade individual shareholders, who own 40% of the company’s shares. It is an approach that appears to have paid off, at least in the short term. The lessons for other digital managers may be niche – what to do when your company is in a public tussle with an activist investor; but as activists pursue more and larger corporate targets, it is a situation that could become increasingly common. Visitors to the telecom giant’s financial archive can easily see summaries of historical financial material for any quarter without leaving the page. The financial results archive page in BT Group’s corporate website investor section has a series of clickable boxes listed horizontally according to financial year – from 2017/2018 back to 2004/2005. When clicked, the box is highlighted in purple and a series of click-to-expand menus appears for each of the four quarters and any supplemental reporting or updates. For example, the menu under 2016/17, ‘Fourth quarter and year to 31 March 2017’, expands to include key developments for the year, a statement from the CEO and links to the press release, webcasts, slides, etc. Unusually, the ‘Key developments’ and CEO statement text are not links, but provided within the menu. Including summary performance information in HTML directly in the click-to-expand menus – rather than providing these as separate linked pages – makes it easier for analysts to do research across years and reporting periods. It also helps that the set for each quarter is comprehensive and that file formats are clearly signposted with icons. One drawback is that PDFs open in the same window, forcing visitors to use the back button on their browsers if they want to return to the archive, but this is a weakness across the whole site, not just the investors section. Another weakness is that press releases jump into the media section, which is on an older template, without any obvious way back. Despite these drawbacks, the summaries on the archive page itself are an efficient and usable resource for investors. Does your IR section sell your firm short? Corporate giants can learn a thing or two from smaller firms when it comes to presenting an investment case online, argues Scott Payton. I recently spent a week judging more than 50 candidates for two online investors relations awards – best digital reporting and best overall digital communications. Quoted companies of all sizes entered, from global giants to small-caps. I learned a lot from the exercise, and found plenty of interesting examples of good practice. But one thing stood out above all else: when it comes to using the web to make a compelling investment case, smaller firms have much to teach their multinational counterparts. FTSE 250 firm William Hill is an example. The UK-based bookmaker’s corporate site has a clear, detailed and engagingly presented Investment case sub-section of ‘Investors’. Intuitive click-to-expand panels contain cogent details of the firm’s strategy, market and performance. Informative graphics illustrate the firm’s business model and market share. Clear charts show key indicators covering the past year. A neat table summarises performance over the past five years. Simple, effective traffic-light graphics are used to show the likelihood and potential impact of various business risks. UDG Healthcare, another FTSE 250 company, takes a simpler and less detailed approach – but its Reasons to invest sub-section of ‘Investors’ still does a good job of clearly conveying overview information about the company’s financial and non-financial performance, as well as the market in which it operates. Compare this to the investor relations sections of the world's biggest companies’ websites – which often don't have an ‘investment case’ sub-section at all, or any kind of equivalent. There are some noble exceptions. BASF’s Investor Relations section includes a detailed BASF at a glance sub-section, for instance. It doesn’t explicitly try to ‘sell’ the chemicals company as an investment proposition, but it explains the company’s activities and strategy well. Similarly, Shell’s Investor Highlights sub-section is a treasure trove for financial professionals researching the company. But why is such material not more common in the IR sections of the world’s biggest companies? Perhaps many big-name large-caps think they simply don’t need to explain to investors who they are, what they do, what their strategy is, or why all this makes them a particularly sound long-term investment. Maybe their IR teams think such material is better off elsewhere on the website (in the About section) – or tucked away in the annual report. If they do think this, I'd urge them to look at what the likes of William Hill are doing and think again about whether similar investment case sub-sections would work on their sites. I think that they would – very well. We recently tweeted a link to an interesting piece of market research from Addison Group on the things journalists most want on a corporate website. One of them is video transcripts - most journalists don't have time to watch the videos themselves, but they do want to pick out quotes. That reminded me of something a former financial analysts told us the other day - that he didn't watch webcasts but did scan the transcripts. This implies that transcripts are not just a useful extra (and good for accessibility), they may actually be more important than the video itself. Which of course leads to the question, should you just publish the transcript and forget the video? Brave, but not necessarily that stupid. IR in France: who's top? We held an event in Paris this week, at which we revealed the best among France’s biggest companies for online investor relations (our global ranking was covered by IR Magazine earlier this month). The top French performers provide some useful lessons for IR and web teams around the world. Both of these companies excel in serving two IR audience groups: analysts researching the company (as opposed to those who already follow the firm); and individual shareholders. Look, for example, at the clear, plentiful overview information about the business and its performance on Sanofi.com; and at the powerful data analysis tools in the accompanying 'Financial Reporting Center’. Look, too, at the warm welcome that Sanofi extends to private investors, and the wealth of information in the dedicated Individual Shareholders section. Over at Total, highlights include clearly presented historical data tables for institutional investors, and a crisply laid out individual investors’ Publications page, stocked with useful material for visitors looking for both quick overviews and deep detail. Indeed, our French IR ranking highlights the fact that France leads the world when it comes to serving individual shareholders online. If you’re interested in how this can be done well, the dedicated retail investor sections from Air Liquide and L’Oreal are well worth looking at too. This insurance giant shines at serving a third audience group: analysts who know the company (and therefore want historical performance data, quarterly results materials, webcasts and the like). 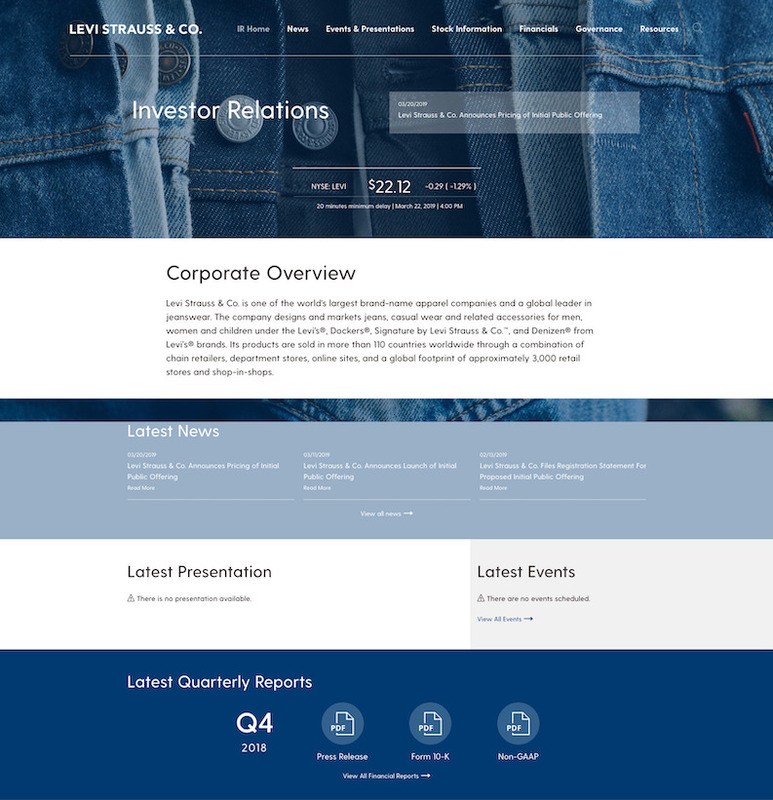 Highpoints of this site include a polished quarterly results index with a wide range of resources, including Excel financials, transcripts and podcasts; plus an exceptionally elegant and well-executed webcast service. · An engaging ‘Why Invest in Air Liquide?’ section – a particularly sensible provision for firms that do business in areas that might not be self-explanatory (like ‘liquid air’). · Intelligent and effective use of video on L’Oréal’s Shareholders Corner landing page, in which private investors say ‘what they like about their relationship with L’Oréal’. Conducting the research for this ranking uncovered some other interesting trends among French firms’ online estates. For example, unconventional navigation systems are unusually common on French corporate websites. In some cases even the primary menus break with convention. Four of France’s biggest 20 companies have no visible primary menu at all, opting instead for a mobile-style hamburger menu even in the site's desktop ‘mode’. This undermines usability by ‘hiding’ a crucial navigation tool. Tablet/mobile investor apps also remain more prevalent on French corporate sites. Four of the top five French companies in our IR ranking continue to offer an investor app for phones and tablets (L’Oréal, Air Liquide, Sanofi and Total), bucking the global trend away from corporate app development due to disappointing uptake among investors and others. HTML annual reports also remain more common in French IR sections than elsewhere. Five of our Top 10 companies offer an HTML version of the annual report (Orange, Vivendi, Air Liquide, L’Oréal and BNP Paribas), even as many companies have been moving to abandon such services, to save money. This may be a yet further sign of a very French devotion to relationship building with private shareholders. Though Bowen Craggs’ research – and that of the Financial Reporting Lab at the UK’s Financial Reporting Council – indicates that private investors actually prefer a simple, hyperlinked PDF to a whizzy HTML report. So when you’re trawling through French IR sections looking to cherry-pick ideas, it’s probably worth thinking twice before adopting all the fancy features you’ll find there. Sue Harding, director of the Financial Reporting Lab at the Financial Reporting Council, kindly joined us in Paris for a panel discussion about what investors and analysts really want from companies’ online IR communications. Her team’s report on current use of digital media in corporate reporting is interesting and useful. Download it for free here.